Nd YAG laser is used for the treatment of vascular lesions (spider leg veins; angiomas ; ruby type) and in some instances, veins visible on the corner of the nose. It is effective on the vessels of one or two millimeter in diameter, which corresponds to almost all visible vascular lesions. For larger diameter vessels (varicose veins), surgical treatment will be needed. Effective and well tolerated, vein laser treatments require 4-8 sessions in principle, depending on the type of lesions and their indication. After the sessions, redness and possibly some bruising may occur at the point of flashing, since the blood vessels will rupture due to the rising heat of the laser (energy capture by the hemoglobin in red blood cells). There is a risk of discoloration for darker skin tones. These side effects do not interfere with every day activities. However you should refrain from extreme sports and steam rooms (sauna, hammam) immediately after the session. A NdYag Laser session for the leg veins lasts 20-50 minutes depending on the size of the area to be treated and the number of pulses required. You are comfortably lying during the whole session, medical laser eyewear protects your eyes. We use neither cold nor anaesthetic, to avoid contracting the vessels before treatment. The NdYag laser emits short, intense pulses that cause destruction of blood vessels. The light ray is set so as to be captured by the hemoglobin of the red blood cells contained in the vessels. The energy captured transforms into heat which will cauterize the vessels and enable them to resorb. Veins having different depth, width and/or colour, the laser technician will adjust the settings of the NdYag during the session, the aim being to obtain an immediate "erasing" of the vein on the surface. The flash is slightly sensitive, especially at the knees or ankles, and you can massage or use a cold roller after the laser treatment, bringing immediate relief. A soothing cream is also welcome at the end of the session. Side effects These treatments have few side effects, apart from a discrete local inflammatory reaction (redness) or the appearance of small, benign hematomas or crusts. These are all temporary and disappear on their own. In general, skin type I-III supports laser treatments better than an IV-VI phototypes. Indeed, our experience shows the risk of reactions is increased with dark skin, as well as increased risk of localized depigmentation or pigmentation after a laser treatment. For this reason, we prefer to carry out a preliminary test for dark skin. Avoid direct sun exposure (natural or solarium) 3 weeks before and 3 weeks after a NdYag laser treatment. Heat (hammam, sauna, hot baths) should be avoided during the 4 days following each session (risk of excessive dilation of the vessels). Sports are not recommended (running, fitness, cycling, etc.) 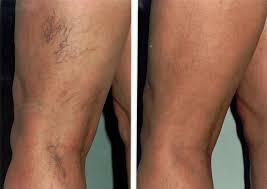 for 48 hours following a treatment of the leg veins with NdYag laser. Eventual hematoma or oedema will be soothed by the application of an anti-inflammatory cream or a cooling gel. Post-procedure makeup is allowed 24 hours after a NdYag laser session. The same area can be treated again at the earliest after four weeks. However, most repeat treatments take place after 6-8 weeks in order to allow time for the vessels to reconstitute and any marks to subside. The number of sessions varies from person to person. Each session brings an improvement, with fewer unattractive vessels remaining after each treatment. As a precaution, we do not practice laser cosmetic care for pregnant women, children, black or recently tanned skins, nor shall we treat suspected lesions on skin, or a person having suffered from skin cancer in the past. Any prior treatment that could potentially interact with skin permeability or skin regeneration capacity should be avoided before NdYag laser treatment. People who have extremely fragile skin or tend to suffer from post-inflammatory hyperpigmentation should avoid this treatment. Roaccutan, St. John's Wort, anti-inflammatory drugs and anticoagulants, as well as any medications at risk of photosensitization are contraindicated. Telangiectasias are known to increase with sun exposure, so it is advisable to avoid direct sun exposure after any vein treatment of the legs. In case of new unsightly leg veins, a few years later, there is no need to wait. By treating them quickly as soon as they appear, one short session should suffice to make your legs beautiful again for several years.